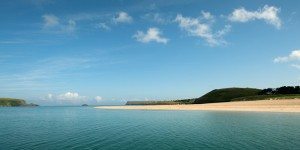 Padstow Bay and the surrounding area has received official protection after the Government designated it a Marine Conservation Zone. Stretching from the shoreline to around 50 metres below the water, the inshore zone includes a number of marine habitats, from sandy bays to rocky shores and kelp forests. Trevone and Trebetherick host the most extensive rocky shores on the north Cornwall coast. All manner of marine plants and animals live here, including algae grazing limpets, filter feeding mussels and barnacles. The rare Celtic sea slug has even been recorded at Trebetherick. The Bull near Trevose Head offers a different marine community altogether; a kelp forest provides shelter for many species including fish and crustaceans such as the crawfish and European spider crab. Blue mussel beds are also found here. Bottlenose dolphins have been recorded using the area and Moule Island, off the Rumps, is home to the largest nesting colony of puffins in Cornwall.